★ The Associated Press correspondence Suzan Fraser and Ayşe Wieting report that the mood among opposition supporters in Turkey's biggest city is one of jubilation but also worry - fear that their win in Istanbul's mayoral race could be overturned in a recount taking place after the ruling party challenged the election results. In an unexpected setback to President Recep Tayyip Erdoğan, the opposition snatched away his ruling party's quarter-century-old stronghold of Ankara, the capital, in Turkey's local election last Sunday. The opposition also won a tight race in Istanbul, the country's financial and cultural capital, where Erdoğan himself rose to power as mayor in 1994. The opposition party's mayoral candidate in Istanbul says he's confident that the result of a recount of votes in the city will confirm his victory, and renewed an appeal to President Recep Tayyip Erdoğan to help end the standoff. In an interview with the Associated Press on Thursday, Ekrem Imamoglu says Erdoğan's ruling party has the right to appeal the vote. But he criticized what he called an unprecedented move in Istanbul for a recount of votes that were deemed invalid. ★ The Istanbul election board has rejected a bid by Turkey's ruling Justice and Development Party to annul the local election in the city's Buyukcekmece district, an Justice and Development Party official told Reuters on Friday after the opposition narrowly won the vote in the city. ★ Election officials expanded a vote recount in Istanbul late on April 4, CNN Turk said, as the ruling party of President Tayyip Erdoğan pushed its appeal against its shock defeat there in local elections. ★ According to The Committee to Protect Journalists, an Istanbul court on April 3 sentenced seven guest editors who took part in a solidarity campaign with the now-shuttered daily, Özgür Gündem, the television and news website Medyascope reported. The court convicted Faruk Eren, Ertuğrul Mavioğlu, Celal Başlangıç, İhsan Çaralan, Fehim Işık, Öncü Akgül, and Celalettin Can of "making propaganda for a [terrorist] organization," and sentenced all but one of them to a suspended 15-month prison sentence. Can was also sentenced to 15 months in prison, but the court did not delay the sentence, according to the report. He is free pending appeal. ★ The New York Post had an editorial titled "Columbia kowtows to Turkish tyrant". In the editorial, the post said "Columbia University functionaries are citing 'academic standards' and planning 'irregularities' for the last-minute cancelation of a panel on the rule of law in Turkey, but it seems more like a cave to the despot who now rules in Ankara." "Trouble started after Y. Alp Aslandogan was added to the panel. He's the president of the Alliance for Shared Values, a New York-based umbrella organization for the Hizmet movement -- aka the 'Gülenists' that tyrant Recep Tayyip Erdoğan blames (with no evidence) for a 2016 coup attempt. "And Erdoğan has lots of points to pressure the school: Columbia has a center in Istanbul and a Turkish studies center founded with a $10 million gift from the family of a Turkish businessman. Crossing the dictator could cut off the money spigot. "So much for Columbia's commitment to free and open speech." ★ Turkey's main international airport in Istanbul is closing and moving to a new base in a massive logistical operation. The relocation of Atatürk International Airport to Istanbul Airport on the Black Sea shores —dubbed the "Great Move"— began early Friday and is expected to end Saturday. 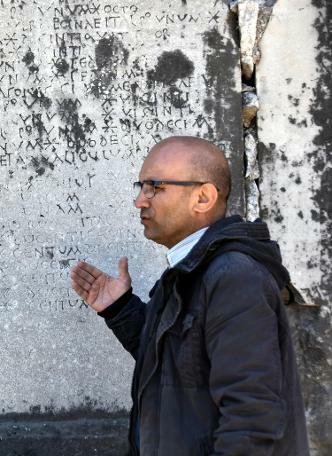 ★ Archaeologists excavating in the ancient city of Stratonikeia in southwestern Turkey have deciphered what is written on a wall some 2000 years ago. The dense writing on a huge wall, approximately 250 ft.², turned out to be a price list for produce at a marketplace. The list is very detailed, for example, for each quality and type of olive, there is an entry. Seleucid king Antiochus established Stratonikeia around 270 BC on the site of an ancient Carian town, Idrias. 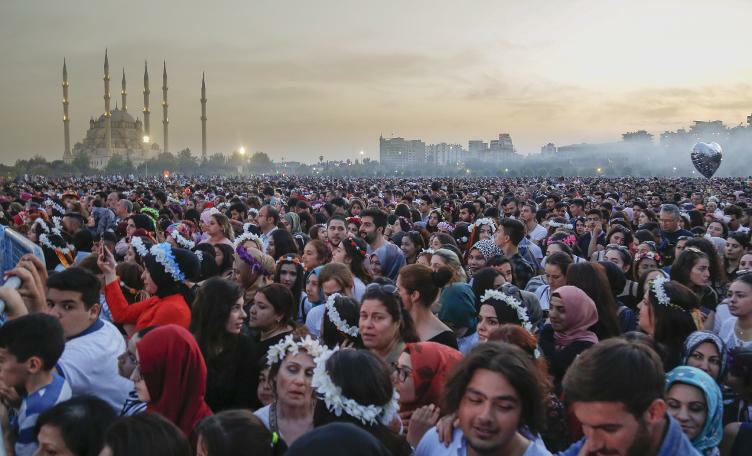 ★ Turkey's southern Mediterranean city of Adana started the Seventh Orange Blossom Carnival. 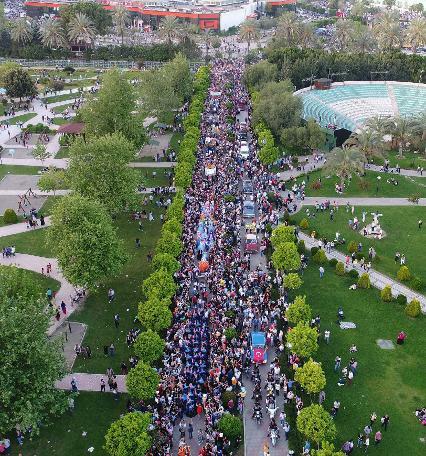 Many Turks and foreign visitors traveled in large numbers to the city so much so that the hotel occupancy rates reached 100% news reports write. During the carnival, there will be over 100 events and a costume show parade. With the 100,000 outsiders, the attendees to the events are expected to rise to 1 1/2 million. The Orange Blossom Carnival will and on Sunday, April 7. 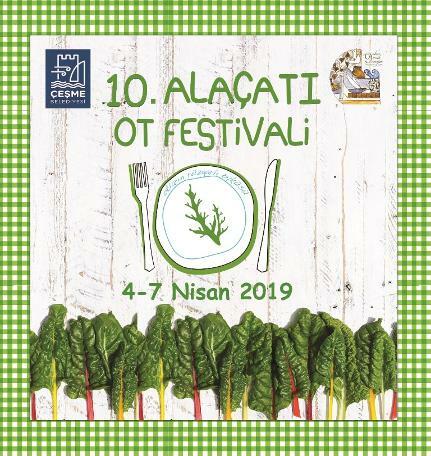 ★ Another public event, the 10th Wild Plant Festival will be taking place April 4-7 in the town of Alaçatı in the Çeşme Peninsula on the Aegean coast of Turkey near Izmir, the third large metropolitan area of Turkey. There will be many events throughout the Festival including art exhibitions. The theme of the festival this year is "chard". There will be food made with chard and other regional dishes. In the cooking workshops, the attendees will make dishes from chard. On April 4, at a lecture at the local Botanical Gardens, agricultural engineer Ms. Sinem Tetik talked about local wild plants. 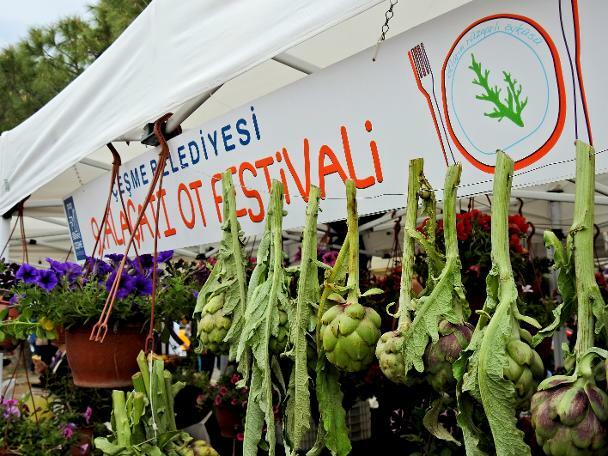 On the second day of the festival Professor Dr. Eren Akçiçek had a talk titled "Olive Oil and Our Health". On Saturday, April 6, when the attendance is expected to peak, at the Mastic Tree Garden with a ceremony people will plant mastic trees. Mastic trees are native to the Eastern Mediterranean but are declining in numbers. They are in the same family as pistachios. The aromatic, ivory-colored resin, also known as mastic, is harvested as a spice from the cultivated mastic trees. Mastic gum is principally used either as a flavoring or for its gum properties, as in mastic chewing gum. It is also added to Turkish ice cream, Turkish delight and Turkish puddings. In addition to its culinary use, the resin is used in the production of cosmetics such as toothpaste, lotions for the hair and skin, and perfumes. 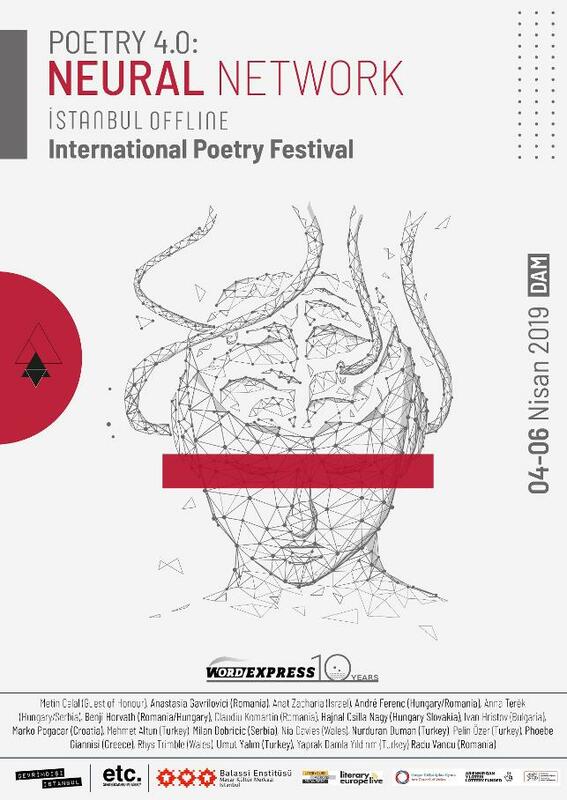 ★ The Istanbul Off-Line Poetry Festival has started on April 4 and ended Saturday, April 6. 20 poets from 10 different countries attended the festival. The theme of the festival was "Poetry 4.0: Artificial Neural Networks". The guest country of the Festival was Hungry and the guest poet was Metin Celal of Turkey. In addition to poetry readings, the festival had translation workshops, activity for colleges, art path walks, wine tasting, roundtable discussions, dance and music performances. All activities for the festival was free of charge. ★ Spanish pianist Javier Perianes was the guest of classical music concert series of Istanbul's Boğaziçi University on April 3. The pianist performed works of Chopin, Falla and Debussy. Perianes was born in 1978 in Spain. He has performed in distinguished concert series throughout the world, having made appearances in New York City's Carnegie Hall, Concertgebouw Amsterdam, the Tchaikovsky Conservatory in Moscow, the Shanghai Conservatory, Madrid's Auditorio Nacional, Palau in Barcelona, recitals at the Ravinia and Gilmore International Festivals in Chicago, Festival de La Roque-d'Anthéron in France and the Konzerthaus in Berlin. He has been a frequent prize-winner at competitions, including First Prize and Gold Medal at the 42nd International Competition Premio Jaén de Piano; First Prize at the 8th International Piano Competition Fundación Jacinto e Inocencio Guerrero; and was a prize-winner at the 14th International Competition Vianna da Motta in Lisbon. 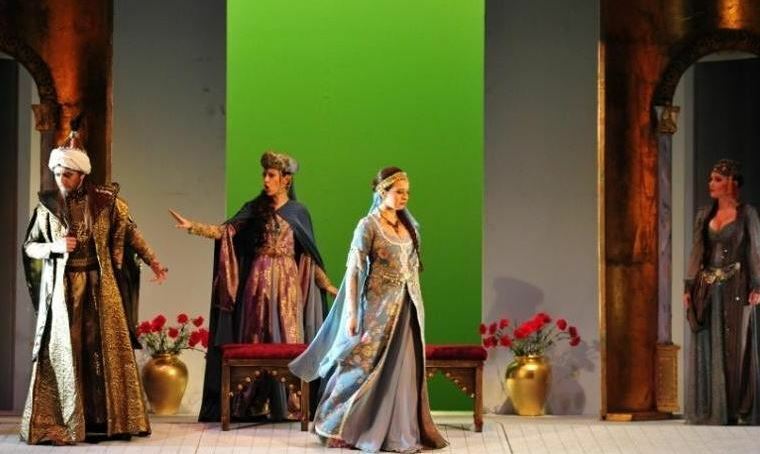 ★ The State Opera and Ballet is staging Vivaldi's 1735 opera Bajazet under the direction of Mehmet Ergüven at the Süreyya Opera in Kadıköy on the Asian side of the metropolitan Istanbul area. The story is about the fate of Ottoman Sultan Beyazid I after being captured by Tamerlane in 1402 at the Battle of Ankara. ★ The 36 International Ankara Music Festival has started on April 4 and will continue until April 25. The Festival will host hundreds of artists and groups. In addition to prominent Turkish artists, the Festival will have guests from Germany, Brazil, Estonia, France, Georgia, Spain, Italy and Ukraine. The musicians and groups will perform classical music, dance and jazz. Among the guests are young Brazilian guitarist Yamandu Kosta, Manolo Carrasco, and Group Flamenco. Virsky Ukrayna National Dance Group, which has received more than 50 awards during its 75 years of existence, will be present with its 100 dancers and musicians. From the Czech Republic, Josef Spacek-Miroslav Sekera violin and piano duo will also give a concert. ★ Soprano Corinne Winters will be in Turkey for the first time. She will perform in the accompaniment of the Borusan Istanbul Philharmonic orchestra on April 11. Ryan McAdams will direct the orchestra. Before the concert, Serhan Bali will interview Winters at Istanbul's Dolmabahçe Palace. Corinne Winters is a fast-rising operatic soprano garnering acclaim the world over for her portrayals of Violetta, Mimì, Tatiana, and Desdemona. She is originally from Frederick, Maryland. 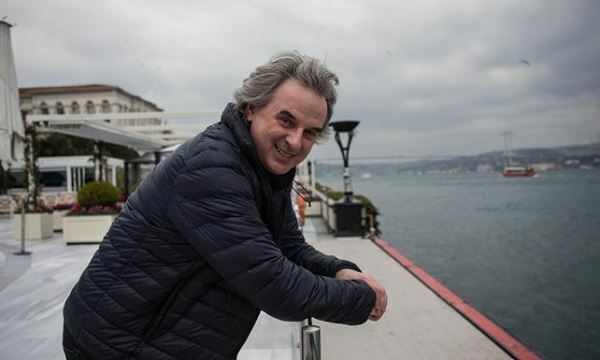 ★ One of France's most popular writers, Jean Christophe Grangé, was in Istanbul for the publication of his latest book in Turkish. Grangé usually writes mystery novels. He is also a journalist and a screenwriter. His latest book is titled "The Land of Dead", and the French version was published just a week before the Turkish one. ★ Istanbul's Akbank Sanat will show a Woody Allen film in its series of film screenings titled the "Film Psychiatry Seminars" on April 10. The Woody Allen film will be "Midnight in Paris". The film follows Gil Pender, a screenwriter, who is forced to confront the shortcomings of his relationship with his materialistic fiancée and their divergent goals, which become increasingly exaggerated as he travels back in time each night at midnight. ★ The 17th International Mobile Fillmore Women Film Festival that started on March 7 in Istanbul has arrived in Izmir this Saturday. Throughout Sunday it will be screening movies for the residents of Izmir. Among the films will be French director Agnes Varda's "One Sings, the Other One Doesn't Sing". The master director Varda passed away on March 29 at the age of 90. ★ Turkish painter Semiha Berksoy's painting "Love in the Moonlight" is in an exhibition called Moon in Paris. The painting is shown along with paintings from Dali, Miro, and Chagall. Semiha Berksoy was born in 1910 in Istanbul and passed away in 2004 at the age of 94 again in Istanbul. In addition to being a painter, she was an actor. Berksoy started her acting career with the role of Semiha in the first Turkish sound movie "On the İstanbul Streets" directed by Muhsin Ertuğrul in 1931. She was cast in operettas in Istanbul theaters early in her career. She sang in the first Turkish opera Özsoy in 1934 (commissioned by Turkey's first president and the independence war hero Kemal Atatürk, composed by Adnan Saygun). She was honored as the first Turkish opera singer and awarded with the opportunity to go to Berlin Music Academy for further training. She started her international singing career in 1934, performing in Turkey, Germany and Portugal, becoming known as a Wagnerian soprano. 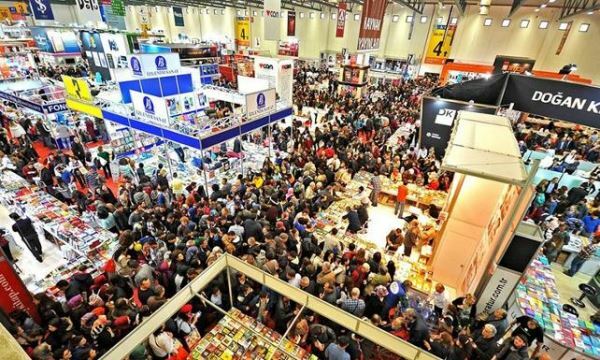 ★ The 24th Izmir Book Fair started today in the Pearl of the Aegean. 450 publishers and civil society organizations will be participating in the fair. In addition, there will be 120 cultural activities. Many authors will be signing their books throughout the fair. The fair will end on April 14. ★ In the European Weightlifting Championships being held in Batumi, Georgia, Turkish weightlifter Şaziye Erdoğan received a gold and a silver medal in the women's 45-kg category . The championships will and on April 13 . there are 20 weightlifters from Turkey . ★ In the European Taekwondo Union championships hosted in Turkey by the Taekwondo Federation of Turkey in Kemer township in Turkey's southern Mediterranean province of Antalya there are 541 athletes from 26 countries. In the first two days of the competitions Turkish athletes received 5 gold, 11 silver and 7 bronze medals. For more information on these schools, drop an exalt trh@turkradio.us.